Experience the pristine beauty of the North Fork Valley and Glacier National Park, the only intact ecosystem in the lower 48 states! Home of wolf, elk, black and grizzly bear, eagle, mountain lion, deer and moose. The sun rises over majestic peaks of the Livingston Range marking the Continental Divide to the east, and sets over the forested Whitefish Range. 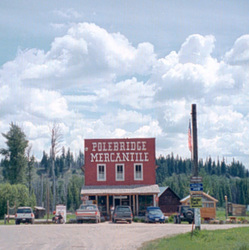 The unique and historic Polebridge Mercantile is nestled between the Continental Divide and the Whitefish Range, just a mile from the northwest entrance to Glacier National Park. no traffic lights, no crowds, no electricity, no hassles. Polebridge is an ideal setting for your reunion, retreat, or mountain get away. Raft, canoe and fish the North Fork of the wild and scenic Flathead River or in nearby Kintla or Bowman Lakes. Hike gentle strolls to technical climbs in and out of the park. Ski all winter in Glacier National Park or snowmobile from Canyon Creek to Big Mountain. Bicycle to or from West Glacier or enjoy day trips to Bowman or Kintla Lakes. The 'MERC' provides groceries, fresh ground coffee and home baked treats (Danish, bread and sandwiches, etc,) gifts, gas, propane, film, fishing tackle and beer. The Polebridge Mercantile is open 7 days a week and cabin rentals available all year! The Northern Lights Saloon is open daily from Memorial Day Weekend - September 15. After September 15, call 406-888-5669 to learn Saloon hours. Directions: The Polebridge Mercantile is located 32 miles north of Columbia Falls on Road 486, in the North Fork Valley of the wild and scenic Flathead River between the continental divide on the east and the Whitefish Range to the west. We are one mile from the Polebridge entrance to Glacier National Park.